Green Schoolyards: Happy Students & Healthy Watersheds — Ruekert & Mielke, Inc.
by Maria C. Kealey, E.I.T. School districts are one of the largest landowners in almost every municipality across the Country. According to Green Schoolyards America, over 132,000 public and private K-12 schools manage an estimated 2 million acres of land. Green Schoolyards America is a nonprofit organization whose mission is to inspire and enable communities to enrich their school grounds and use them to improve children’s well-being, learning, and play while contributing to the ecological health and resilience of their cities. Here are a few examples of how your community’s ecological health can be improved through incorporation of green infrastructure on school properties. Utilize porous pavement in parking lots or porous rubber playground surfaces to decrease surface runoff. One example product is Flexi-Pave, which is a porous material made from recycled tire chips and can be used for play equipment safety zones. Increase green space and native plantings to promote infiltration. School gardens can even be utilized as outdoor classrooms. As an example, research what butterflies live in your area and what plants they depend on, then plant a butterfly habitat in your schoolyard. Incorporate rainwater harvesting to collect and store rainfall for later use in watering and maintaining the school grounds. Students can even help in designing and building the cisterns as a school project. Just as important as incorporating new green infrastructure techniques is maintenance of existing practices such as storm water ponds, infiltration basins, and rain gardens, which are utilized by many school districts. The functionality and efficiency of these practices should be evaluated regularly and maintenance, such as pond dredging, should be performed when necessary. Schoolyards present a unique opportunity for a transformation from grey to green infrastructure as many public schoolyards, especially in larger cities, are covered in asphalt. Green schoolyards can help to foster healthy urban watersheds and wildlife habitats, while improving the health and happiness of students. For a local example, check out this initiative by Milwaukee Public Schools to install green infrastructure throughout their district. 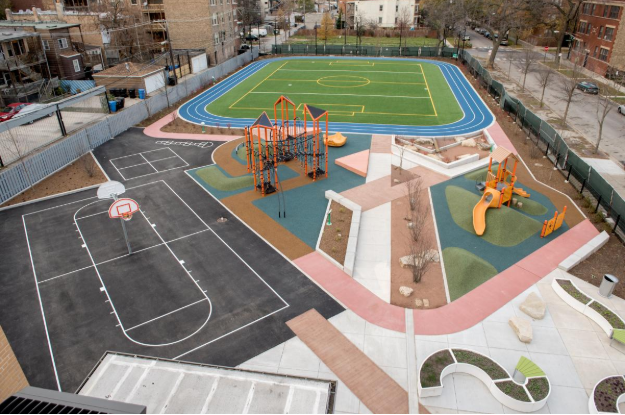 For more information on the value of green infrastructure in schoolyards, and how to begin the transformation, check out this webinar from the EPA. Maria brings fresh innovation coupled with effective communication skills to her role as a project engineer. She has been employed with Ruekert & Mielke, Inc. (R/M) since 2015 while she completed her degree in Civil Engineering and obtained a certificate in Environmental Studies at UW-Madison. Maria has been involved in a wide array of projects thus far, providing her with comprehensive knowledge of the industry. She understands the needs of clients to exceed expectations. These skills allow her to efficiently manage projects and coordinate design efforts, while maintaining timely communication with community staff and residents.